There's yet another new company to talk about today. This time out I'll be looking at some models from a new company called HiTech Miniatures. They specialize in 28mm sci-fi and fantasy models cast in resin, and they also make some accessories, also cast in resin. This is the first model available in their sci-fi range of 28mm Hero scale models. The first thing to catch my eye is that this is really big model. So big that I have to question it's claim of being 28mm Hero Scale. Then I took a closer look and noticed that the scenic base, which is part of the model, takes up about 10mm of height. Now if I measure from the eye to the bottom of his boot, then he's 40mm high. Also I should note, he is wearing rather thick and bulky armor, which very much resembles a Terminator-style armor. Therefore 40mm high is about right for a model wearing a Terminator-style armor. There's 5-pieces that make up this model. There's the majority of the sword from the hilt up, the handle of the sword, the left and right arms, and then the body. This is also an all resin model. To my surprise it's also an extremely clean resin model, because I couldn't even find any mold lines, which is a first. Even the ForgeWorld stuff as nice as it is, also it usually comes quite messy with lots of flash and mold lines, but on this HiTech Miniatures model I couldn't find a single mold line, or flash at all. The sculpting is very crisp and detailed on just about every piece of this model. There's some intricate detail work in the area of the chain-mail on his upper thighs, and there's even very crisp lettering along the bottom of the cape all around the entire edge of it. Every piece of the armor is adorned with some kind of little detail too. The facial detail is there as well, but he looks like a very old bald commander, so old that he's bordering on the line of being elderly looking. It's too bad, because the helmet he's holding in his left hand would have looked a lot nicer on the shoulders of this model, than the old geezer sculpt that's sitting there. As I stated earlier on, there's a scenic base sculpted right onto the model itself, so there's no basing needed, unless you wanted to add a little something to what's there already. He's standing on some sort of stone-like surface, and there's some nice little texture to it, with little detailing of bricks around the edges. The footprint is about that of a standard 40mm round base too, only with a tiny bit cut out, as the sculpted base isn't perfectly round. The Sci-Fi Commander sells for 19.10 Euro, which converted equals $27.00 USD. This is a 5-piece set of scenic resin bases, and they claim this is a Tech inspired set, but these really have more of a Steampunk vibe than Tech if you ask me. There's lots of cogs and clock gut/part bits on them. They might want to rename these Steampunk Bases. What I like most about this set is that it comes with five completely unique sculpts. As much as I love the Micro-Art Studio stuff, they do pack their sculpts at random, so getting one of each from them is usually hit or miss. With this set you have five unique bases to work with, which is really helpful when you have five models that are all very similar, and you want to give them some individuality. If these were just a hair bigger at 30mm round, they'd be perfect for Warmachine because of the Steampunk vibe they have. On the flipside these are still quite cool looking bases which could be useful in a variety of other games like AE Bounty, Warhammer 40k, Urban War, etc. These cost 6 Euro, which converted equals $8.40 USD. This is another set of their 25mm scenic bases cast in resin, only these are sculpted as rock formations with bits of ground mixed in. You get 10x bases in this set, but it's a set of five unique sculpts, and you are given two of each sculpt in the set. There's normally not a lot one could say about a base with some rocks or shale on them, but what I did find useful is that almost every top of these bases is rather flat, which makes placing a model onto these bases a lot easier than most. Most scenic bases are simply small models, and works of art in their own right, but it's evident that most sculptors forget that we will need to actually set a figure on top of the base when it's done. So while many scenic bases are amazing models, they're all not usually level enough to properly set a model on top of them, that is usually without some extensive extra modeling work. With these bases I can't see it being a problem setting models on top, because the topmost surfaces on each one is level enough that very little extra work is needed to use them. Therefore I really think these would be useful for the guy who hasn't worked with scenic bases before, and wants to add a little more flavor to say his or her Space Wolves, Chaos Marines, Lord of the Rings models, etc. This set sells for 7.50 Euro, which converted equals $10.50 USD. I think HiTech Miniatures is off to a good start. However they do still have some work ahead of them if they want to make a more lasting impression with gaming enthusiasts. I just don't think that the Sci-Fi Commander is the best example of a flagship model for them, but it does show their potential. The resin bases however are a different story, I think they're right on the money, and are easily as nice as the stuff I've seen elsewhere like the Micro-Art Studio stuff. I think the Rocky bases are perfect for Space Wolves, and also for a variety of other models. At $10.50 USD for 10x bases, that equals about $1 and some change per base, which makes them quite an affordable option to consider if you need to outfit a few 10x man squads with them. 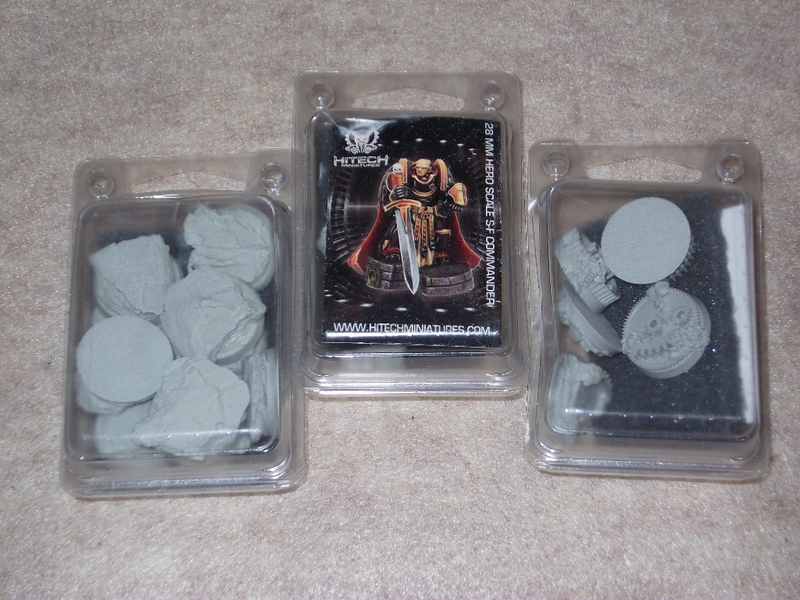 Most other similar scenic resin bases are in the $6-$8 USD range for 4x-5x 25-30mm round bases. I think the Sci-Fi Commander would be a much better looking model if it were not for the head on it. That really holds it back, and somewhat ruins what would have been an amazing model. A helmeted head would have been a much better option. Quite frankly the head on it is sculpted nice, but it makes the model look like a little old elderly man, more than a grizzled and hard as nails veteran, which is what I think they were aiming for to begin with. Everything else about the model visually is quite exceptional, and it's amazingly clean, so with some work it could be an amazing resin stand in model for Warhammer 40k gaming as an HQ or Captain in a Space Marine army. Also at what they're asking for the model, they should include a 2nd head option anyway. At almost $30 USD it should include a few extra heads, plus an extra weapon option or two. On the flipside all hope isn't lost for this model, because you could probably hack that old geezer head off with minimal effort, and use a different head. I'm tempted to hack it off myself and use one of the resin Steamknight heads from MaxMini on it. The helmet he's holding in his left hand could work too, but I have a feeling I'd ruin the helmet, or the hand if I tried to remove it from the hand. So I'll probably cut that existing helmet away the best I can, in attempt to keep the hand nice, and then put a shield or another weapon of some sort in his left hand when I replace the head. 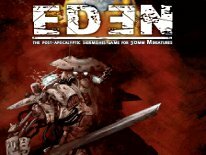 I think HiTech Miniatures is doing a number of things right, and they show a lot of potential. Therefore I look forward to seeing what they come up with next. They just need to keep in mind that when you're asking premium pricing for a model, everything about it should be premium, and it should also offer some options at that price-point. Be sure to check out their website to see what other bases, accessories and models that they have to offer.